This volume reports on the latest developments in a small, but exciting field of research–namely the in situ exploration of planetary sub-surface layers. This field will become more and more important in the coming decades, since several recent space missions and a few in the near future carry landers that have instruments for sub-surface exploring. Among these are: The ESA-Huygens mission, which successfully landed on Saturn´s moon Titan in 2004, ESA´s comet mission Rosetta including its lander Philae, expected to land on a comet nucleus in 2014, and several lander missions to the Moon and to Mars. Different methods exist for gaining access to the sub-surface of a planetary body, and these are discussed here in detail. Among these are: hammering devices, drilling devices, melting probes, and penetrators. A major part of the book is devoted to describing such devices and to a comparison of their performance in different planetary environments. 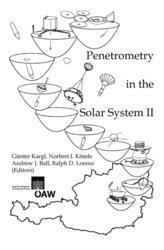 Penetrators can be considered "hard landers"; they approach the planetary surface at high speed and enter the sub-surface simply through their high inertial momentum. Such devices are subjected to very high inertial forces during landing and penetration, and the instruments aboard such vehicles must be able to withstand these high deceleration forces without being damaged. In contrast, hammering and drilling devices and melting probes are launched in a more gentle way and need soft landers for their operation. All of these methods are expected to be applied in the near future on the surfaces of Mars, the Moon, as well as a number of comets and asteroids. The application of melting probes is restricted to surfaces consisting of ice, but this might be the most effective means for exploring deep layers on icy satellites like Jupiter´s moon Europa or Saturn´s moon Enceladus, which are of high interest with regard to astrobiology.